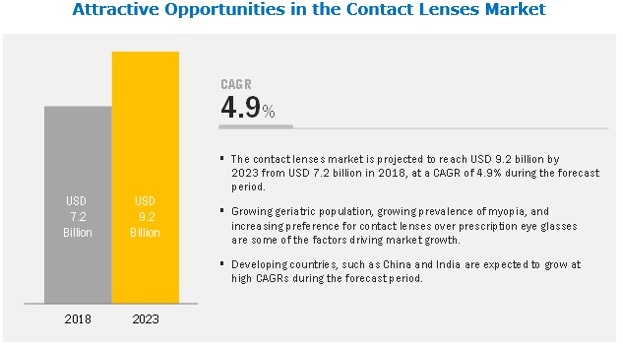 [180 Pages Report] The contact lenses market is expected to reach USD 9.2 billion by 2023 from an estimated USD 7.2 billion in 2018, at a CAGR of 4.9%. The study involved four major activities to estimate the current market size for contact lenses. Exhaustive secondary research was done to collect information on the market, peer market, and parent market. The next step was to validate these findings, assumptions, and sizing with industry experts across value chain through primary research. Both top-down and bottom-up approaches were employed to estimate the complete market size. Thereafter, market breakdown and data triangulation methods were used to estimate the market size of segments and subsegments. In the secondary research process, various secondary sources such as Bloomberg BusinessWeek, Factiva, and Dun & Bradstreet have been referred to, so as to identify and collect information for this study. These secondary sources included annual reports, press releases & investor presentations of companies, white papers, certified publications, articles by recognized authors, gold standard & silver standard websites, food safety organizations, regulatory bodies, trade directories, and databases. Further breakdown of Latin America market into Brazil, Mexico, and other countries. The global contact lenses market is projected to reach USD 9.2 billion by 2023 from USD 7.2 billion in 2018, at a CAGR of 4.9%. Growing prevalence of myopia, growing geriatric population, and increasing preference for contact lens over prescription eyeglasses are the major factors driving the growth of this market. On the other hand, shortage of trained ophthalmologists and regulatory barriers in the market are some of the factors restraining market growth. The report analyzes the global market by product type (including model, design, material, color variation, and application), distribution channel, and region. On the basis of design, the market is classified into spherical, toric, multifocal/bifocal, monovision, and cosmetic contact lens. In 2018, spherical contact lenses accounted for the largest market share due to the higher adoption of these lenses by optometrists and patients to treat myopia (nearsightedness) or hyperopia (farsightedness). The rising prevalence of myopia worldwide is expected to further drive the growth of this market segment. The global market, by model, is segmented into daily wear, extended wear, and traditional contact lenses. The daily wear contact lens segment to dominate the market in 2018. The large share of this segment can primarily be attributed to the advantages offered by daily wear contact lenses, such as easy wearability, no requirement of lens cleaning (in the case of disposable daily wear contact lenses), and no requirement of overnight wear. Based on the type of materials used to manufacture contact lenses, the market has been classified into polymethyl methacrylate (PMMA) contact lenses, silicone hydrogel contact lenses, hydrogel contact lenses, hybrid contact lenses, and gas-permeable (GP) contact lenses. 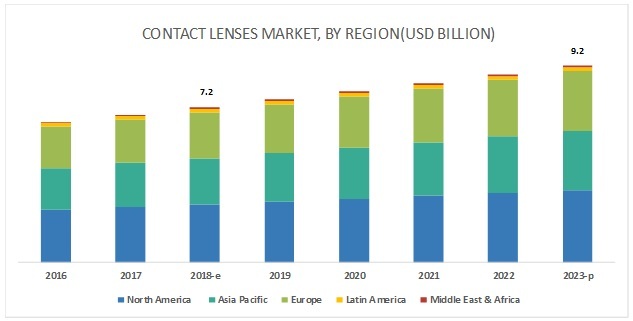 In 2018, the silicone hydrogel contact lenses segment to account for the largest market share owing to their high demand among end users. This is because silicone hydrogel contact lenses are comfortable to wear, offer greater wettability, allow the transmission of a high amount of oxygen to the cornea, are useful for daily wear or extended wear, and have a lower risk of infections. Depending on the color of contact lenses, the market is segmented into opaque contact lenses, enhancers/tinted contact lenses, and visibility tinted contact lenses. The opaque contact lenses segment is expected to account for the largest share of the market in 2018. Due to their use for aesthetic as well as therapeutic purposes, these lenses have witnessed greater adoption as compared to other types of colored lenses. In 2018, conventional contact lenses to account for the largest share of the contact lenses market. Based on application, the market is segmented into conventional, orthokeratology (Ortho-k), and decorative (plano) contact lens. The conventional lenses segment to account for the largest share of the market in 2018. The increasing prevalence of myopia, rising geriatric population (geriatric individuals are more prone to presbyopia), and the growing preference towards the use of contact lens over prescribed eyeglasses are the major factors driving the growth of the conventional market. Retail stores to dominate the contact lenses market in 2018. On the basis of distribution channel, the market is segmented into retail stores, e-commerce, and hospitals & clinics. In 2018, retail stores to account for the largest share of the market, followed by hospitals & clinics and e-commerce. The large share of the retail stores segment can be attributed to factors such as the rising disposable income and the rising demand for cosmetic contact lens. Moreover, these stores dispense OTC daily wear disposable contact lens, resulting in higher volume of contact lens dispensed through retail stores. In 2018, North America accounted for the largest share of the market. The global market has been segmented into five regional segments, namely, North America, Europe, Asia Pacific, Latin America, and the Middle East & Africa. In 2018, North America accounted for the largest share of the market. The rising prevalence of age-related eye diseases, increasing healthcare expenditure, rising disposable income, and technological advancements in contact lens and related products are some of the key factors driving the growth of the market in North America. The prominent players in the global contact lenses market are Johnson & Johnson (US), Alcon, Inc. (US), CooperVision, Inc. (US), and Bausch + Lomb (US), Carl Zeiss Meditech AG (Germany), HOYA Corporation (Japan), Essilor Group (France), SEED Co., Ltd. (Japan), Menicon Co., Ltd. (Japan), and BenQ Materials Corporation (Taiwan). Johnson & Johnson (US) is a leading provider of contact lens and ophthalmic surgical products. The company offers a wide range of contact lenses and ophthalmic surgical instruments that include products such as surgical laser systems, IOLs, and ophthalmic viscoelastic devices (OVDs). The company continuously focuses on R&D activities to expand its product portfolio. Johnson & Johnson has a strong presence in the US and is focusing on expanding its geographical presence by strengthening business operations in emerging markets. As a part of its business strategy, the company majorly focuses on product launches to strengthen its position in the market. J&J also has a large customer base, catering to the needs of more than 60 million patients per day across 103 countries to improve or restore their vision. CooperVision, Inc. (US) is another leading player in the market. The company continuously focuses on investment in research and development and product launches to expand its product portfolio and strengthen its share in the market. In the past three years, the company has launched high-quality lenses and has also added features to its contact lenses. In January 2018, CooperVision launched its MyDay toric daily disposable contact lenses in the US. In December 2017, the company announced the availability of expanded parameters for its Avaira Vitality toric two-week contact lenses. In June 2015, the company launched its MyDay silicone hydrogel daily disposable contact lenses in the US market. The company also adopted acquisitions as its key growth strategy in the past three years. Through acquisitions, the company strengthened its technological competence and geographic reach. CooperVision operates in highly competitive environments. Therefore, as a part of its business strategy, the company supports many local social initiatives to provide training to those who wear contact lenses and to educate patients, ophthalmologists, and medical staff about contact lens benefits and risks. In September 2018, Alcon, Inc. (US) its launched AIR OPTIX plus HydraGlyde multifocal contact lenses for presbyopia patients. In June 2018, Bausch & Lomb (US) launched its Bausch + Lomb ULTRA for Astigmatism contact lenses in cylinder power of -2.75D. In December 2017, CooperVision, Inc. (US) acquired Paragon Vision Sciences (US), a manufacturer of premium orthokeratology (Ortho –K) specialty contact lenses and oxygen permeable rigid contact lens materials. In January 2016, Bausch & Lomb (US) held a distribution partnership with Vision Source (US), to distribute Vision Source’s contact lenses and contact lens care products. Who are the top ten players operating in the market? What are the driving factors, restraints, opportunities, and challenges in the market? What are the industry trends, and technological and regulatory scenario of the market? What are the growth trends in the market at segmental and overall market levels?